Well, I've about recovered from attending the NY ThrillerFest. Interesting experience, to be at a convention where almost everyone you meet is a published author. I'm not sure I liked it. Okay, I didn't like it. I felt like a fish out of water...or a hobo at a small-business expo. This was clearly not my crowd. Oh, everyone was nice enough (although I did get snubbed by Alafair Burke, but that was probably my fault for saying I thought she was a fictional character. Is that rude? Come on, she's in her dad's books! ), but having a zombie book did not earn me many brownie points--most folks either made a face or just politely ignored it. And I admit the feeling's mutual: I don't read much genre fiction either. In fact, I wouldn't have known who anyone was if not for the help of author Nate Kenyon, who generously interpreted for me. It was mostly thanks to him that anybody talked to me at all. When Nate wasn't around, I tended to find myself in halting conversations with scary-looking dudes who were trying to publish books about either religion or dismemberment. On Nate's suggestion, he and I volunteered at the registration desk, which was a much better way of meeting people than just mingling. It gave us a purpose, allowed us to raid the freebies, and enabled me to plant my home-made Xombies promo in every welcome kit I handed out. Nate also persuaded me to set up a last-minute meeting with my editor, something I had been reluctant to do on such short notice. But she agreed to see me! Maybe it's because of all the years of rejection, but that blows my mind, that a schmuck like me can get the editor of a New York publishing house on the phone, much less be invited to have coffee with them. Of course I got lost on the subway. My panel discussion went well, considering it was about the use of exotic settings in thriller writing. 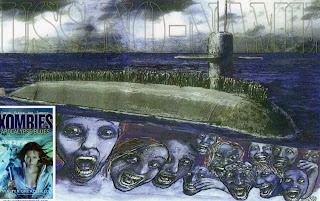 I don't think too many people read Xombies for the exotic settings, but I think I made a pretty good case for it, considering that a lot of the book takes place aboard a nuclear submarine (in itself pretty exotic) searching the world for a safe refuge. I'm a ham, so any chance to blabber self-importantly is fun for me. And next week I get to do it again, at Comic-Con! The food at the various mixers was pretty good, there were free drinks, and the Thriller Awards Banquet was unbelievable, like eating dinner in a cathedral. That's no exaggeration--the ceiling at this place (Cipriani's) had to be seventy feet high, with huge marble columns, an open bar that glowed like a candle-lit altar, and extremely diligent waiters who hovered as silently as monks. The best thing was that the seat to my right was empty but the waiters treated it like a person, setting out a whole extra meal that I couldn't let go to waste. That's not gluttony, people, that's called saving the planet.